Created a content type x. Fields: title, body, serviceareas. Added 5 nodes. Selected body field to display. Added nid. Excluded from display. When I click a title from the block, I get views page accordingly. I would like to add one more views block which will select serviceareas field for that node. This block will only display in all the views page. When I click the title link (step 5), I like to display the body field(it works now already). I also like to display serviceareas field (step 7) to views 1 and views 2. I am not sure how to join the views 3 to views 1 and views 2? So that I can see serviceareas related to the views page I am on. Node/1 Title: title1 Body: body1 Serviceareas: serviceareas1. Node/2 Title: title2 Body: body2 Serviceareas: serviceareas2. When I click the title 1(views 2), views page(views1) should display body1(works) and on the same page another region, views block(views 3) should display serviceareas1. When I click the title 2(views 2), views page(views1) should display body2(works) and on the same page another region, views block(views 3) should display serviceareas2. I placed views2 and views3 block in the same region. Views 2 should display all the nodes titles(works). Views3 should display only field from the nid(does not work). Views3 block: I added one field. Contextual filter: I added nid. When I click a title link from views2, I get body from views1 page but I do not get the field from views3 block. Below is the view3 block -contextual section. By using this module you can add an extra field to your View1 and View2, which shows the result of your View3. In your updated question, Views3 has become a separate block. 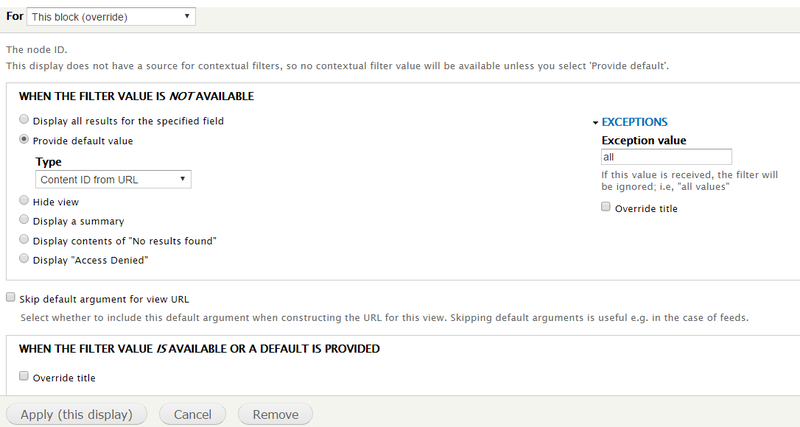 Using a contextual filter you can limit the rows to be only from a specific node (id), the one that is being displayed. The answer on How to associate the current Node ID when running from Block layout? should point you in the right direction, your contextual filter should be similar to the one you used in View1. How to associate the current Node ID when running from Block layout? How to display the same field with various nodes in the same row using Views? How merge two different views on single page? How to setup a Facebook page block for each user?